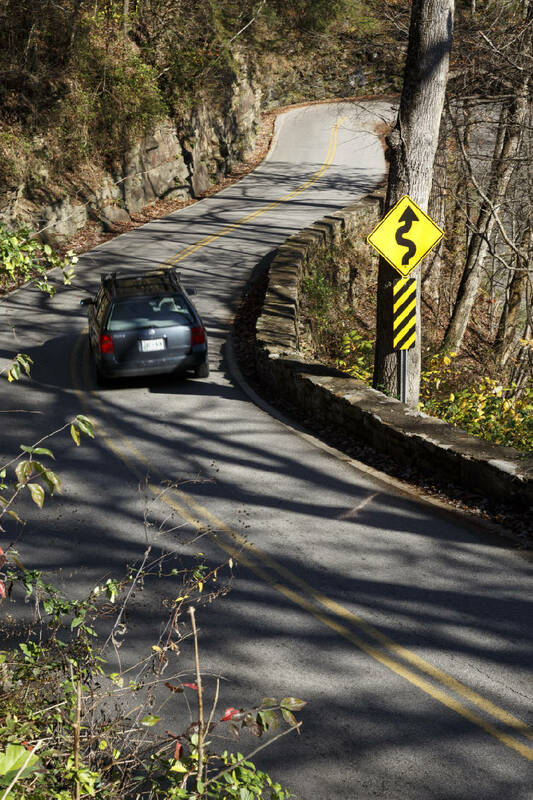 Vehicles travel through a hairpin turn on the W Road on Tuesday, Nov. 10, 2015, near Walden, Tenn.
For generations, the turns at the top of Signal Mountain's W Road have been the bane of local residents as unsuspecting truckers realize too late that a tractor-trailer can't possibly manage the three sharp switchbacks that give the road its name. Now technology is adding to their woes. Local officials say too many truckers are relying on GPS systems for directions, and the find-the-shortest-route software often steers them straight up the mountain — and into trouble. 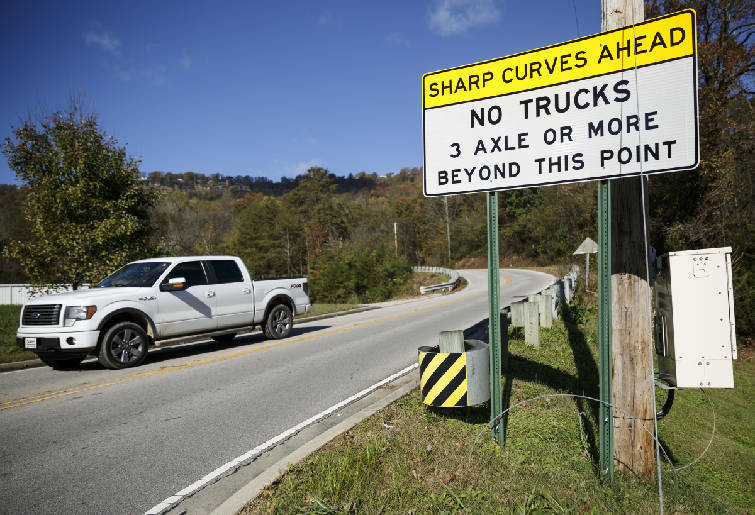 "Truckers punch in their destination, and when it tells them that the fastest route is up the W Road, they don't think anything of it," said Walden Mayor William Trohanis, whose town lies at the top of the W.
Vehicles travel on the W Road on Tuesday, Nov. 10, 2015, near Walden, Tenn.
Two truckers ran afoul in the past month, and an oversized limo also was unable to make the turn, according to Chattanooga Towing Co. owner Jojo Scott, whose tow trucks often are called to unjam the W. It was the first time this year that two trucks got stuck within a two-week period, Trohanis said. Officials said new signs have been posted that clearly warn truckers the W is no place for an 18-wheeler, but the signs keep being ignored. "You have to have common sense and read the traffic signs," Scott said. "If a sign says 'no,' it means no." But drivers might not be solely to blame. Coming up the mountain, the first warning appears in the middle of the roundabout that connects Mountain Creek Road and the W — a spot where a driver's attention may need to be on oncoming traffic. The other two sets of signs are bright red and clearly state that three-axle trucks are banned, but by the time drivers see the signs there is no place to turn around. The exact number of times trucks have gotten stuck each year is hard to assess, because police officers don't always issue citations to wayward truck drivers. The Hamilton County Sheriff's Office has cited five semi-truck drivers there in the past year, according to spokesman Matt Lea. But if a driver is in a rented U-Haul truck, for example, and has never been on the road before, he may get a pass, Lea said. Drivers who know the area and should know better are fined. But the fines are not that steep. Depending on whether the citation is written by the sheriff's department or the Tennessee Highway Patrol, the fees range between $155 and $185, including court costs. The sheriff's department said it often gets calls about trucks blocking the W, but by the time deputies arrive there is no sign of the vehicle, which apparently backed out of trouble on its own. Last week, for example, the sheriff's department got four calls but found only one vehicle when deputies responded. 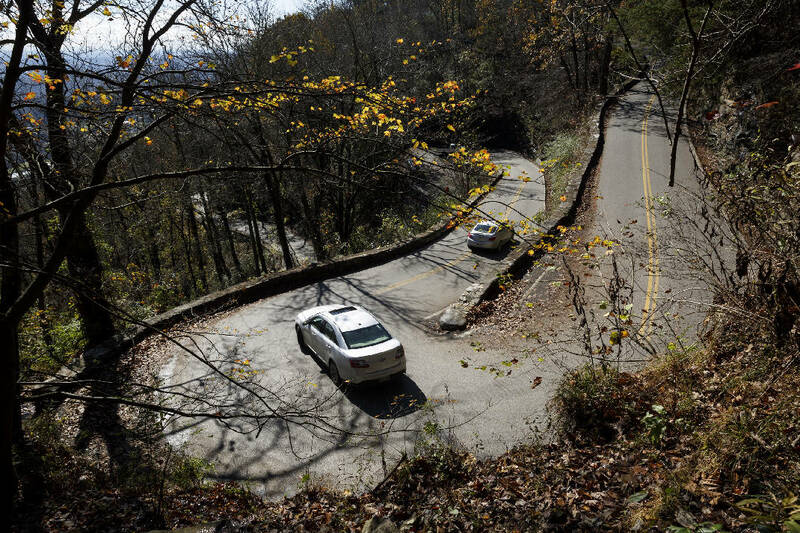 Unlike Signal Mountain Road, which starts out with a sharp curve and keeps swinging left and right all the way up the mountain, the W begins with one sharp hairpin turn and then straightens out into a series of mild curves, climbing slowly up beneath the bluff of the mountain. It's only when it gets near the top that the road snaps sharply left, then sharply right, and then back left again, with each turn almost 180 degrees. The W's switchbacks are about the tightest possible. Even with automobiles, it is generally necessary to stop before turning to allow oncoming traffic to pass. Swing too wide and you're in the wrong lane; cut it too close and the bottom of your car scrapes against the side of the road. The W ends up a few blocks shy of U.S. 127, better known as Taft Highway, atop the mountain in Walden. It is a shortcut for drivers who don't want to go through the town of Signal Mountain itself. Vehicles prepare to travel up the W Road on Tuesday, Nov. 10, 2015, in Chattanooga, Tenn.
Walden resident Susan Snow said the W is the primary means of getting up and down the mountain for people in the Walden area. "It's a safety issue," Snow said. "We need as many roads open as possible. You never know when something is going to happen." The road was built in the 1890s as an unpaved toll road. In the early years, even horse-drawn wagons and early automobiles could barely make it up the steep grade. Photos from that era show passengers climbing out of buggies and autos to lighten the load, clambering uphill on foot. The road has long held a place in local lore, with some parents telling their children that the turns are so steep that "you can see our taillights ahead of us." For regular W drivers, an etiquette has evolved on encountering oncoming traffic on the switchbacks, as one writer detailed recently on social media site Reddit. "In the morning, let the people going to work go," someone identified as Discofun wrote. "Stay back and let 5-10 cars go down. In the evening, let the people going home go. Stay back and let 5-10 cars go up. To the newbies, no one is going to hit you. Everyone is rolling at 5 mph. When someone yields to you, swing wide. And when you yield to someone make sure you give plenty of room so they can swing wide. Bottom line, no one road rages. Just chill and wait your turn." Contact reporter Steve Johnson at sjohnson@timesfreepress.com, 423-757-6673, on Twitter @stevejohnsonTFP and on Facebook, stevejohnsonTFP.